NOTE: Eventon Auto update might not be available for some of you as we have reduced our update checking period on your installation to cut down on our server usage and to avoid server crashes. First activate your copy of eventON. Go to Dashboard> Updates and click Check Again to run plugin update checker. 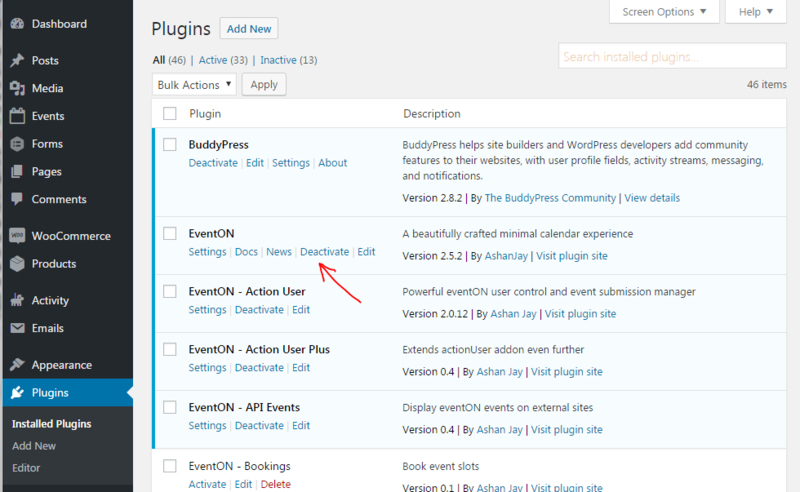 Go to Plugins> Installed Plugins if there is a new eventON update you should see it under the EventON plugin row. Click Update Now to perform auto update. Go to My Account > Downloads and download the latest version of EventON zip file. NOTE: You will NOT lose any saved settings by updating this way. As for styles and appearances, after updating via FTP go to myeventon settings and click save changes without making any changes to re-save styles and appearances. However we strongly advice, backing up database (in phpMyAdmin) and backing up and translation files inside /lang folder. In order to install new eventon version from backend please follow these steps. IMPORTANT! Before doing this: We highly recommend you backup phpmyadmin database and your website files in wp-content folder. 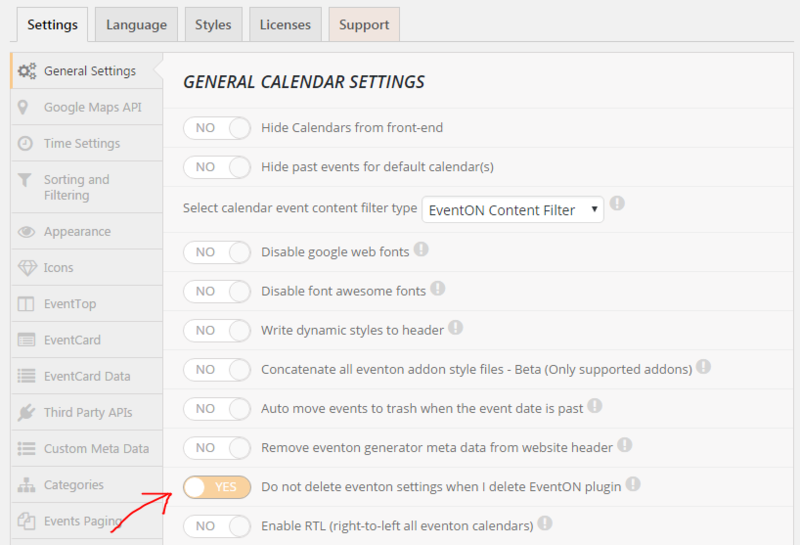 First go into eventon settings and save Do not delete eventon settings when I delete EventON plugin and then Save Changes. WARNING! – When updating from EventON version 2.6.6 & 2.6.7 you must leave the above settings to NO (due to code error)! – If you are on EventON v2.6.8 or up this setting must be set to YES in order to keep already created events. Nexto to your website’s wp-admin Plugins > Installed Plugins and Deactivate eventon. If you have eventon addons you will see eventon missing notifications popping up at this moment and you can ignore these during the update process. Next Delete eventon from your site. Once uploaded, go back to Plugins > Installed Plugins Now activate newer version of eventON.